Charles Darwin was perhaps the naturalist most responsible for altering humanity’s view of nature (and human nature) over the past two centuries. Darwin’s main idea was not new, nor was it complete, but his belief that species evolved over time by means of natural selection has been profoundly influential throughout the modern world. His work and his successors have had a powerful impact on biology, ecology, paleontology, and social theory. In addition, his ideas continue to influence religious thinkers, literary and visual artists, psychologists, and politicians. Darwin began his life as a mediocre student and a young adult with no clear fixed sense of an occupation. After “wasting” his time (Darwin’s word) as a student of medicine and theology, he was invited to sail on H.M.S. Beagle as a geologist and naturalist in 1831. He returned in five years as a seasoned collector and recorder of scientific information. His own research, along with the work of Lyell, Herschel, and Whewell, led him directly into the species question, then being widely debated by naturalists and others. The evidence of Darwin’s voyages and observations made it seem impossible that existing creatures were not directly related to previously existing forms of life and thereby to each other. So traumatized was Darwin by the implication of his emerging theory, that he refused to publish his findings for two decades. 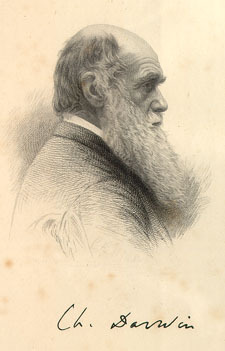 The letter in which he may have committed his conclusion to paper for the first time conveys Darwin’s clear sense of the power of his insight: “I am almost convinced (quite contrary to opinion [sic] I started with) that species are not (it is like confessing a murder) immutable” (January 1844). The budding naturalist Charles Darwin took a journey that led him to become perhaps the most famous scientific traveler of the past two centuries. His four year voyage, the practical purpose of which was mapping and harbor identification for the British navy, also produced a volume with a title that combines the genres of travel narrative and natural history: Journal of Researches into the Natural History and Geology of the Countries Visited during the Voyage Round the World of H.M.S. ‘Beagle’ . Darwin had originally been invited on the voyage merely as a companion to the captain, but once his careful journals and observations began to circulate on shipboard, he was retained for the entire journey in the role of naturalist and textual recorder of the expedition. In Darwin ‘s case, his life as a natural scientist literally began only when he became a traveler. But of course, Darwin is more struck by the differences he notes between plants and animals on these volcanic rocks and on the mainland. His continued emphasis on these differences leads him toward the greatest observation he would make on these travels: “Hence, both in space and time, we seem to be brought somewhat near to that great fact B that mystery of mysteries—the first appearance of new beings on earth” (403). Evolution through natural selection will prove to be the only explanation for these otherwise unexplainable differences among similar species in different environments. The traveler becomes a scientist at precisely that moment when he can draw a valid conclusion from the varied details of his numerous observations. When Darwin concludes the narrative of trip around the world, he lists several motives for and benefits of such travel and such travel writing: pleasure derived from new scenery (“none exceed in sublimity the primeval forests undefaced by the hand of man” ); the sight of indigenous peoples “could our progenitors have been men like these?” ), spectacles of nature (“the Southern Cross, the cloud of Magellan . . . the waterspout—the glacier . . . the lagoon island . . . an active volcano” ), love of the outdoors (“living in the open air, with the sky for a roof and the ground for a table” ), and the satisfactions of adding to human knowledge of the globe (“the map of the world ceases to be a blank” ). It is not surprising that Darwin adds one benefit from world travel that now rings with a hollow thud in our own twenty-first century ears: “the march of improvement, consequent on the introduction of Christianity throughout the South Seas .. . . [and] the philanthropic spirit of the British nation . . .It is impossible for an Englishman to behold these distant colonies without a high pride and satisfaction. To hoist the British flag seems to draw with it as a certain consequence, wealth, prosperity, and civilization” (537). Even Charles Darwin’s ideological underpinnings can place him at a far remove from our own postcolonial sensibilities. In conclusion, however, he says that “nothing can be more improving to a young naturalist than a journey in distant countries” (537).